– Recognize that living things can change over many generations. – Variation within a population is important because it is the fuel for current and future adaptation. Adaptations can be a behaviour, anatomical, or chemical feature. – Offspring who inherit a certain characteristic are more likely to survive and reproduce in certain environments than offspring that don’t. Aim: To show that even when we try to replicate things exactly, we create small variations. To start the lesson, with the children watching, draw a lizard on the board (make sure you colour it in, as well as drawing the outline). Once you have finished, ask each child to draw a similar lizard on an A4 piece of paper (make sure pens, or crayons of different colours are available). Once finished ask all the children to hold their pictures up in the air. Ask the class whether all the lizards are the same or whether they are different? They should notice that they are all slightly different (different sizes, colours, longer or shorter legs, etc.). At this point introduce the term variation. Explain how there is variation between all different animals , as for example between cats and dogs. You could also have images of different lizards on a PowerPoint slide to reiterate your point and show how it happens in the natural world. Aim: To introduce the idea of adaptation, natural selection and change over time/evolution. To introduce the idea that it is advantageous to have variation in a population. Next split the class in half. Each half of the class now has to decide which one of their lizards will survive the best in a certain scenario (for ideas of different scenarios, click here). Give the whole class the same scenario. Once you have described the scenario each half of the class must work as a group to decide which lizard they think will survive the best in the given situation. Once they have decided, pin the chosen lizards onto the board. Then each half of the class should try to copy the best lizard they have chosen onto another A4 sheet of paper. Once the children have finished drawing their lizards repeat the same process as before, asking each half of the class to choose the lizard they think will survive best in the scenario outlined at the beginning of the activity. Once they have chosen their lizard it should be pinned up on the board. Repeat this exercise a third time. The scenarios stay the same throughout the activity. Now, by looking at the 7 lizards on the board, you can show the class how over generations animals can change. Ask the students what has happened to the lizards from the first teacher drawing to the third round? What differences can they see? Explain that although the lizards have only changed a little bit over the three generations they have drawn, over many generations large amounts of change could be observed. Imagine how different the lizards would become after 10 generations?! Explain how over millions of years animals can change enough that they become a different animal altogether. At this point introduce the concept of adaptation, explain how the lizards that survived/were the best (i.e. were chosen by the each round) have characteristics that help them to survive and reproduce. Therefore they are said to be adapted to their habitat ( define habitat). The lizards that survived were better adapted than those lizards who did not have advantageous characteristics and therefore died/were not chosen. Explain how over time the characteristics of the lizards in the population changes. Explain that this process of population change is called natural selection (define natural selection). The population of animals is said to have evolved (changed over time) towards having characteristics that improve survival. Make sure the children are aware that in nature this is happening over thousands of years, and not within one lizard’s lifetime! Ask whether lizards in the third round of both half of the class are the same? 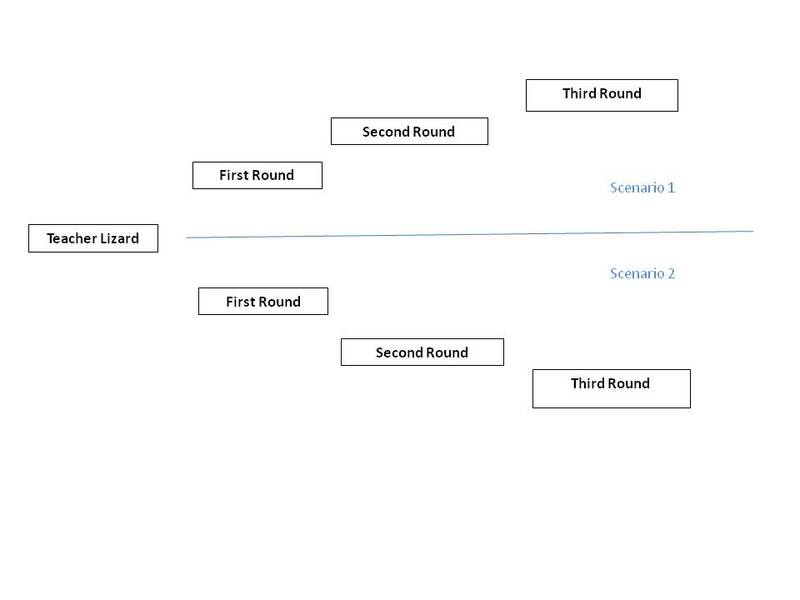 They should notice that they are different because the characteristics that were selected for in the first round would be slightly different. For example, one half of the class may have chosen a lizard with short legs whilst the other half of the class may have chosen a brown coloured lizard. This difference in characteristics will increase as the number of rounds of selection increase and the advantageous characteristic will become more dominant. Next, using the last set of lizards the class drew, introduce a new scenario (ideas in the scenario sheet). Explain how the environment is dynamic and often changing, leading to changes in habitats. Ask the class which of their lizards they think will survive in the new environment? Which side of the class has the most surviving lizards? The side of the class that has the most surviving lizards and thus would do better should be the side of the class with the most variation amongst their lizards as they will have more lizards that best fit the new scenario. Discuss how variation is important within a population as otherwise a change in the environment could lead to the total extinction (define extinction) of a certain population of animals. Extinction may occur or example if you have a habitat that becomes fire prone, so all the ground is black. A population with only white coloured lizards would be very vulnerable to predators . It is extremely important that children take away the correct messages from this lesson. Experiments and demonstrations can always go wrong providing incorrect results. If this happens then teachers must explain that incorrect results have been found due to errors in the experiments such as children picking friends lizards, children knowing what they are supposed to do, not a long enough time scale etc. Once this has been explained the correct results should be explained so that the children come away with a correct understanding. Aim: to reiterate how natural selection occurs in a population and to highlight the importance of variation in order to deal with a changing environment. Give each pupil a top trump card (from Top Trump Cards Worksheet) and they should all stand up. Then roll the dice and those children with a number lower than the dice for the chosen characteristic sit down. Discuss what will happen to the population in the new environment especially what the animals will look like after successive generations and natural selection. Then roll the dice again and repeat the process until only a few children are remaining. This highlights how the environment changes (when the dice is rolled) and those that have characteristics suited to the environment survive and those that don’t die. Reiterate therefore how important it is to have variation within a type of animal. Also make sure that the children realise this is happening over a long time scale – thousands of years.